What Can I Do on World Thought in Translation? What Can I Do on the World Thought in Translation website? Use advanced search features to locate documents by a range of biographical criteria. The Advanced Search is the default option when navigating to the search page via the Search tab on the top navigation bar. When you navigate to the search page, you will see by default a search box with a keyword search box underneath to search by two criteria. To add search fields, click the “+Add Search Field” button. You can also choose to limit this search to specific fields of information, like author names or titles, or employ Boolean search operators operators by opening dropdown menus adjacent to each search field. For a brief introduction to the Boolean operators used on the World Thought site, see Sphynx Search. 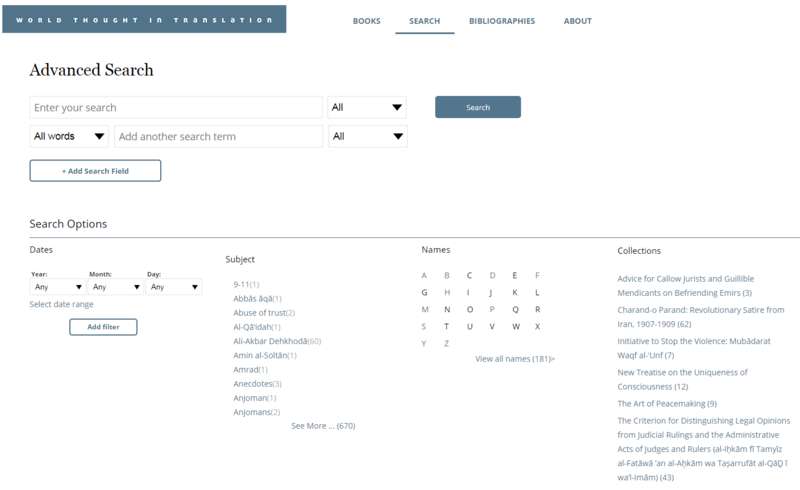 Collections:Limit results to documents within specific collections in World Thought in Translation’s library. These include: titles within New Treatise on the Uniqueness of Consciousness, Initiative to Stop the Violence: Sadat's Assassins and the Renunciation of Political Violence, The Art of Peacemaking: Political essays by István Bibó, and Charand-o Parand: Revolutionary Satire from Iran, 1907-1909. Once you have conducted an Advanced Search, your search results will appear in the central panel of the screen. This table provides basic bibliographic information about each document. You can see a preview of specific documents from the result list in the right-hand panel by clicking on items in the list. If the result list has multiple pages, a navigation tool will appear above the result list. The list of results can be re-sorted by alphanumerically prioritizing Alternate Title (Alt. Title), Author, Contributing Author (Contrib. Author), Publication Date, Relevance, Subject, Title, View Count (# of Views), and Page Count (# of Pages). In the left-hand panel, the filter options available in the Search Options section of the Advanced Search landing page are relisted for quick application of new filters to the search at hand. Clicking these filters will run a more refining search. Finally, once satisfied with your search results, you can open a document by clicking its title or thumbnail image. You can also generate citations for search results by checking the box for one document and clicking the “Export” buttons above the result list as appropriate. Click “Save” to save one or more documents into your library. For more resources related to the Boolean operators used on the World Thought in Translation site, see http://sphinxsearch.com/docs/current.html#boolean-syntax. Some additional helpful resources for Boolean search can be found at http://libguides.mit.edu/content.php?pid=36863&sid=271372 and http://library.duke.edu/services/instruction/libraryguide/advsearch.html. Explore the works available in the World Thought site by viewing featured collections. Navigate to the Browse landing page to view collections within World Thought in Translation. Click a book title in the left hand panel, a book cover under the “books” header, or a “START READING” button to open the collection’s homepage. 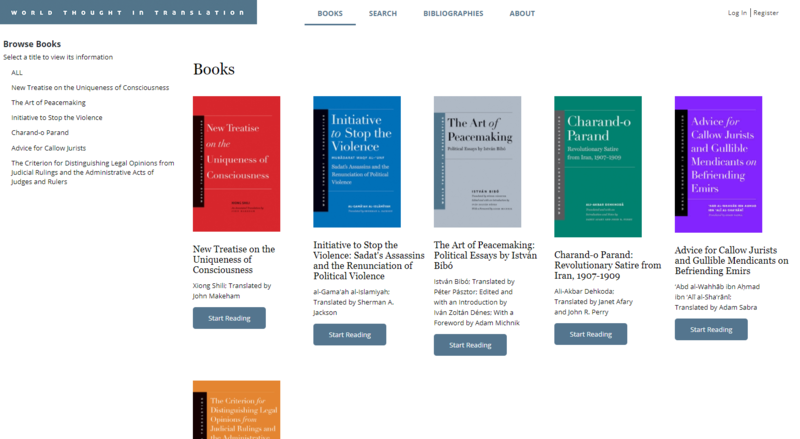 From the homepage, a summary of the collection is displayed over a table of contents with abstracts for each chapter of the book. Documents are viewed in the World Thought site’s document viewer. The document viewer allows you to see all images and text associated with the material you have selected to open. This section outlines the functionality of the document viewer, explaining each section as it appears on the webpage: toolbars, image panel, and text panel. The document viewer toolbar appears above the text viewer and allows you to access the viewer’s functionality. You can save the current document to your personal library (accessible via the My Library page) or export/save a document citation. You can also switch the view between different combinations of image, translation, and transcription. The text viewer panel displays the transcription and/or translation of a document in the World Thought site if available. The text viewer panel can either appear alone or side-by-side with the image viewer panel. The Document Info panel provides metadata about the document being viewed as well as a space to review user-generated content like tags, annotations, bookmarks, and discussions related to the current document. It opens when its icon is clicked and when an annotation, tag, highlight, or bookmark is clicked. It is closed by clicking the “I” icon. Access your profile and manage interactions with other users. The “My Library Home” page provides a summary of your recent activity. My Library is the site’s center for personalized content and community interaction. Here you can view notifications and manage your personal library of saved documents, tags, annotations, and searches, as well and manage private groups. The notifications area of the My Library page is where you receive updates from both administrators and fellow members of the site. Accessible via a tab on the left-hand panel, the Notifications cover such topics as additions to the digitized archive and other updates related to your personal account and/or the general functionality of the site. You are able to save documents to your personal library through both the search result and document viewer screens. Within search result page, you must click the check box next to the documents they wish to save and then click the “Save” button above the result list. The document viewer, also, has a button labeled “Save” on the toolbar just above the image/text viewing panels to access this same functionality. You can access all of your saved documents via the Library tab in the left-hand navigation panel of the My Library page. Clicking on Library, and then on the sub-tab Personal Folders, brings you to a list of all of saved documents. You can store saved documents in folders, and sort then sort your document view by folder, by created date, by last update, or by document title. See “Community Pages” below to learn how to join or create Private Groups. Community Pages display information about how other users see you within the World Thought user community and also allow you to view what other users are researching. The My Profile displays the profile view that other World Thought users will see when you participate in the World Thought community through annotations, discussions or Private Groups. This page, accessible via the left-hand navigation bar of the My Library page, shows basic information (including name, email, school, address, etc…) as well as your subscribed Private Groups. 1. Click on the “Manage Profile” button in the top right corner of the screen. 3. Change the information as needed. Please see the Private Groups Tutorials page for more information on Private Groups. You can keep track of all of your annotations on documents via the My Annotations tab on the left-hand navigation panel in the “My Library” page. You can sort this view by Annotation, Document, Shared, and Date Created. You have the option of sharing annotations with other World Thought users by making personal annotations public. You can also delete Annotations by clicking on the box next to each annotation, and then selecting the delete button towards the top of the screen. NOTE: Only personal annotations can be edited. Once an annotation has been made public, it is no longer editable. This is so that other users can reference your annotation. Be sure to review all annotations carefully before making them public. If you need to report an error, please contact support@worldthoughtintranslation.com. You can organize and manage tags on documents via the My Tags tab on the left-hand navigation panel in the My Library page. To run a search on a tag you have created, click on the tag name.